Hi my name is Barrie and my sales person was Tim Kay and he was great! Buying a car from him was a great experience. I called him about a car I seen online on his day off and instead of calling me back the following day when he got into his office he called immediately back from his home. Now that is what you call great customer service. My wife recently purchased a car from him as well and I have to say Tim will be our family vehicle sales person for life. He has won the Barrie's trust in vehicles. Thanks Tim and A++++ service. Great Experience! After reviewing several makes of cars .I once again decided on a Chevy Malibu. Mario made the buying experience pleasurable. I will use this dealership again. No Hassle! I purchased my first car from Mario. 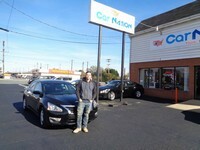 He was able to hook me up with a great deal, and is always there when I have questions or concerns! I would recommend Mario to anybody fresh out of college and is looking for a car! They're The BEST!! 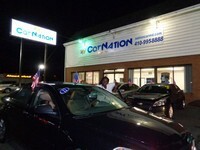 My experience at CarNation was excellent. I am the type to be suspicious of sales people of any kind, but Tim was very friendly, helpful, and honest! He worked with me on my trade and gave me a great deal on my "new" truck. We were still finishing up after closing hours and I did not feel rushed at all!! I'm so happy with my purchase! Thanks! Very Happy! Mario gets to know his customers and guides you through each step of the purchase. He is not satisfied until you drive off the lot fully knowledgeable of your vehicle and completely at ease. Thank you Mario and CarNation! Always Satisfied! Great people to deal with and Mario is very friendly. I was in an out in just under two hours now that's service. I would recommend them anytime. Just Awesome! "Bought a certified vehicle from the dealership. Mario was the Internet manager and he helped me through the whole process from start to finish. Long story short my experience in purchasing a vehicle from this dealership was above average (the best among other 3 dealers I've dealt with in the past). Rest assured, Mario and his team will take care of you if you so choose to do business with them" Great Vehicle Purchase Experience! 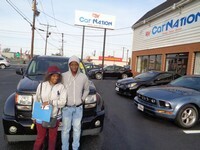 "We purchased our used 2008 ford Mustang with Mario's help and couldn't be happier. We found the vehicle originally online via a different website and after calling him, he confirmed that he did indeed have it on his lot and we could see it. Living 45 minutes away, this was important to us, so that we didn't drive out there to be disappointed. When we arrived at the dealership, the Mustang was parked in the front ready and waiting for us to test drive. He ran over the highlights of the car and we were already sold. Mario is very personable and easy going. 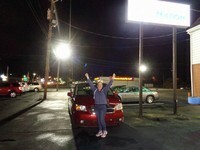 He was very flexible with our timing was not pushy at all (as we all know many car dealerships can be!) He answered all of our questions and I can tell you he really knows his stuff! He was willing to negotiate to get us a good deal. We would most definitely suggest him to family and friends in a heartbeat" We'd give Mario 6 Stars if we could!! 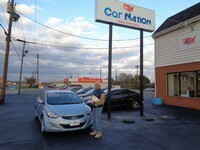 Great salesman, he knows his stuff and great guy! Helped find me a reliable car for work and play and got me a great deal and car is still under warranty and overall a great experience, anyone looking for a good salesmen, find that in Mr.Bobby Bobby is the Best! Personalized experience. Minimal haggling. Had to wait for vehicle transfer. Small glitch taken care of without issue. 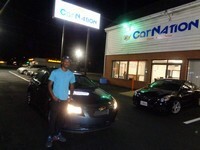 I appreciate the experience and would recommend to any one interested in a car/suv. Great Service! I went to Mario online, then drove 1.5 hours to see him the same day after a kind and honest conversation. I purchased my vehicle the same day! Thank you for making my experience fair, pleasant and not the least bit intimidating! Unfortunately so many car dealerships direct their attention to men. This was not my experience at all (after experiencing that TWICE at other dealerships). Mario treated me as a person and earned my business hands down!! GREAT dealership for women!! 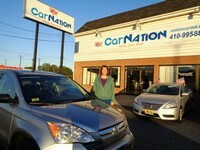 It was a pleasure working with CarNation I have always bought from same dealer for years. I felt right at home, made transition very easy for me. Would definitely buy from them again! Great Experience there! Mario is awesome! He was extremely easy to work with. He helped me get exactly what I was looking for in a automobile. Very friendly dealership - would definitely recommend. 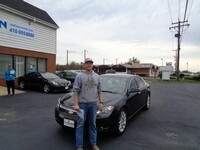 Very Happy with my new Ford Fusion! This was my first experience with CarNation in Aberdeen. I learned of them through searching the net for a particular vehicle I was looking for, and they happened to have a potential "Keeper" for me. I was very apprehensive at first, not knowing anyone at the dealer, or the area. I live about 45 minutes away. I phoned the dealership to confirm that the vehicle I was interested in was still there, and I spoke with Tony Malzone, who informed me that it in fact was still available. I said I'd like to come on in and check it out, and he said, "Great. It'll be up front and ready for you when you get here." I can't say enough about Tony as my sales contact. He was outstanding. No slick sales gimmicks, no pressure, no attempts at manipulative ploys. Just great, accomodating service. It sounds like a cliche, but we hit it off like this guys been my buddy for years. And trust me, I'm a skeptical type of personality. I ended up purchasing the vehicle I was interested in, for a price that I was comfortable with. No hassles. Just civil, relaxed negotiations. Tony went above and beyond when I had questions about carafax info... He was able to locate original service records from original owner, of which detail could not be matched... Unbelievable! Gave me complete peace of mind, which we all know, is close to priceless. I went in expecting to purchase a used vehicle. I didn't even want to consider a new vehicle thinking it was out of my price range.Dmario took the time to give me all of my options and was never pushy. I ended up getting a brand new car that I LOVE and can afford. He even took the time to make sure I knew how everything worked and was set up properly as far as connecting the blue tooth with my phone, etc. I highly recommend CarNation Aberdeen. It was worth the hour drive to get there. I had been looking for a used Altima, which they had on the lot. 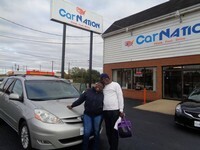 Mario let my wife and I drive the vehicle around the area on our own and then gave us an excellent price. Because we live in Harford County, she was able to get us in the vehicle and drive it home the same afternoon, and to give us extra keys. All in all, it worked out beautifully. Exceeds Expectations!